William (Zev) Chomsky fled Russia in 1913 to avoid being drafted. Elsie Simonofsky emigrated as well, though in her case from Lithuania. William began in the sweatshops of Baltimore, but self educated in Russia, he soon gravitated to teaching at Baltimore's Hebrew elementary schools while working his way through Johns Hopkins. He graduated with a PhD, specializing in the Hebrew language, about which he wrote and taught for most of his life. He met and married Elsie, who also taught Hebrew, and after his graduation they moved to Philadelphia where they taught at the Mikveh Israel congregation religious school. 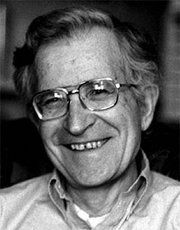 On December 7, 1928, Elsie gave birth to the first of their two sons, Avram Noam Chomsky. In the words of his New York Times obituary, "William became one of the world's foremost Hebrew grammarians." His was a warm and outgoing personality, influential in his field of expertise, and he drew Noam into his love of intellectual matters, academia and language. When he was only 12, Noam was already reviewing one of his father's five books. Late in life, William said his life's major objective had been "the education of individuals who are well integrated, free and independent in their thinking, concerned about improving and enhancing the world, and eager to participate in making life more meaningful and worthwhile for all." It is a telling description of both his aspirations and his effect upon Noam.